I love French roasted chicken – chicken roasted with butter and stock – and I love chicken breasts stuffed with ricotta, so I combined the two and came up with a winner. 1 Preheat oven to 180°C (350°F) and have chicken at room temperature. Rinse chicken inside and out, removing any lumps of fat. Drain, then pat dry with paper towels. 2 In a bowl mix ricotta, breadcrumbs, garlic, chopped rosemary, ½ a teaspoon of salt and a few grinds of black pepper. Slip a finger or two between skin and breast meat of chicken to make pockets. Slip in the ricotta mixture, smoothing it out to reach right along each breast. Pull the skin down. 3 Tie a piece of string around the parson’s nose, then tie the legs together pinning the wings in place, bring the string back to the parson’s nose and tie it in a tight bow. Put the chicken in a roasting tin and pour in the chicken stock. 4 Melt 1½ tablespoons of butter and brush over the chicken. Squeeze on a little lemon juice and sprinkle with salt. You can add lemon halves to the stock in the tin if you wish. Roast chicken for about 1½ hours, basting often. The chicken should be kept moist during cooking; add more stock if it dries up. Stir any sticky goo that forms in the tin into the juices to ensure it doesn’t catch and burn. Once the top of the chicken is sufficiently golden, baste again, then loosely drape it with tin foil. 5 The chicken is ready when the juices run clear when pierced with a skewer – check the thickest part of the thigh, and when the legs are wiggled, they move freely. Remove the chicken from the oven when it is cooked through to the bone and let it rest at room temperature still in the tin for at least 15 minutes, but up to 1½ hours, covered with a ventilated cover. 6 Tilt the chicken and let juices run out of the cavity into the roasting tin. Transfer chicken to a board. Carve chicken into joints and attended to the juices in the tin. Scoop fat off pan juices. Reheat juices and pour in wine or verjuice, and bubble up scraping up any sticky sediment. Taste and add a pinch or two of salt if necessary. Spoon over carved chicken and serve immediately. 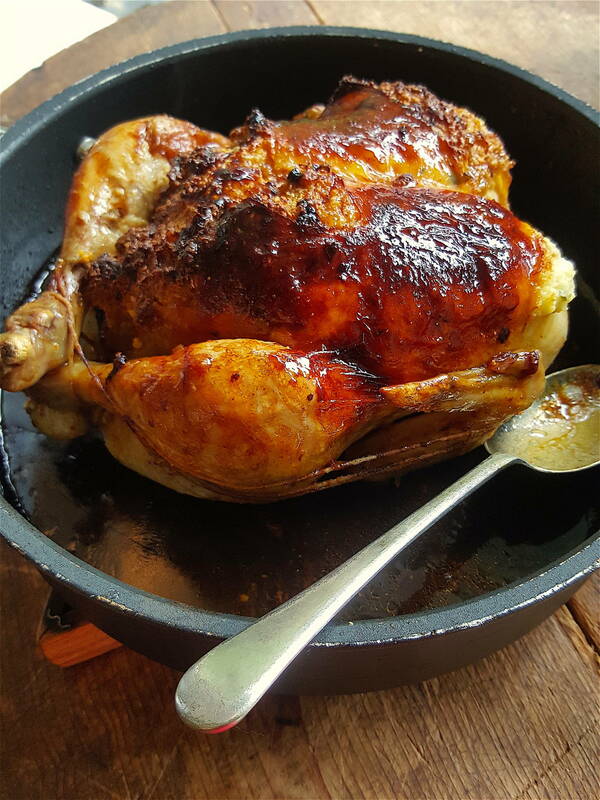 It’s not difficult to roast a chicken like this, but there must always be stock in the dish or any juices will catch and burn, and you don’t want that to happen because the juices are the basis for the jus which is an essential part of the dish. And the size of the roasting tin is important too. If it is too big, the juices will evaporate too quickly as they are spread over a wider surface, and the gorgeous ‘goo’ which forms can scorch and burn ruining the chance of making a tasty jus. If the dish is too small, it makes basting the chicken difficult, and also turning it over during cooking is likely to result in stock splashing everywhere. The juices (stock and chicken juices) will not evaporate quickly enough for goo to form if the chicken is tightly packed in a dish. Choose a tin with enough room to easily turn the chicken during cooking. Hello , I read the above recipes with interest and will try a new approach to cooking this year. Now I’m sure you have a lovely bread and herbs stuffing that would suit my South Island taste and my memories of real stuffings from the past. so glad to hear you are finding some inspiration with Shared Kitchen recipes. I haven’t cooked a roast chicken with stuffing inside the chicken for ages – I like cooking it separately in a dish, buttered, and not too deep, so that it gets crispy on top. It’s lovely like this. Have you tried it this way? I cooked this chicken last night. It was absolutely delicious. The chicken was so moist and tender and I sat at the table for ages picking at the leftovers and trying to find bits with ricotta. I cooked it in my cast iron frying pan and had beautifully caramelised juices to which I added the verjuice and created a beautiful ‘jus’ which I drizzled over the carved chook. It will definitely be my ‘fave’ roast chicken now and I will be adding it to the Easter menu. My daughters and partners will be home for the break and they have huge expectations about the meals!! It sounds like you did the recipe proud Nicola, with all those crumbly bits of ricotta in the dish just too hard to resist. I love how you they form a sort of ‘grainy’ jus with so much flavour. I hope your girls and partners enjoy it just as much. Succulent chicken that falls off the bone – here's how to do it!